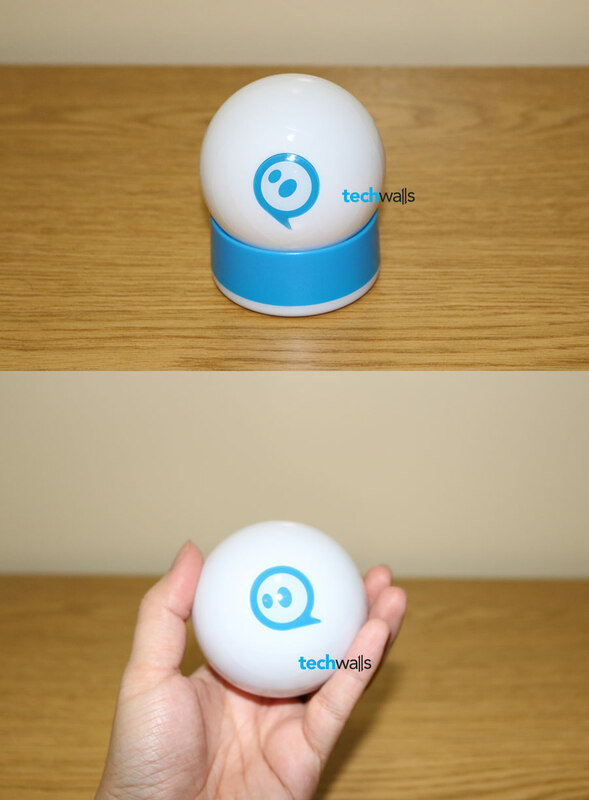 I still remember when Orbotix announced the first generation of Sphero robotic ball 3 years ago at CES 2011. Orbotix released the robotic ball in 2012 and I was not really impressed with the ball at that time. I thought it was just like a remote-controlled car that I can drive around with simple movements, it couldn’t be the future of smart toy as it was said to be. Now I’ve got the chance to try Sphero 2.0, the next generation of the original Sphero. The new version has the same design as its predecessor and it is advertised to be speedier, brighter and smarter. Therefore, I really hope that it could prove I was wrong. Let’s check out my review of the Orbotix Sphero 2.0. The Sphero 2.0 is still made of glossy white plastic with its logo on the front. Its diameter is just around 3 inches, I can hold it firmly in my palm just like a baseball. The manufacturer does recommend not to use the Sphero on hard surface because it could damage the product, so I put it into the Nubby cover, which is a silicone sleeve to protect the ball from dirt, scratches and also add better traction in water. If you want to bring the Sphero outside, you’d better use the Nubby as well. Your ball will be well-protected and it even can swim in water. I’m glad that the new version has been improved significantly. The engine is twice as fast as its predecessor’s and the speed could reach 4.8 mph. The ball is also more responsive and more accurate when you control from the iOS or Android app. The Sphero ball wouldn’t be called smart toy if it didn’t come with the apps. The primary app is Sphero and it works like a RPG game, you will need to complete tasks to earn more points, to level up, to unlock faster speeds, brighter glowing lights and special skills. Actually there are just a few simple tasks like shaking the ball, drive ball without colliding and crash others. Orbotix is really smart when they launch a series of games for the Sphero to keep users engaged. 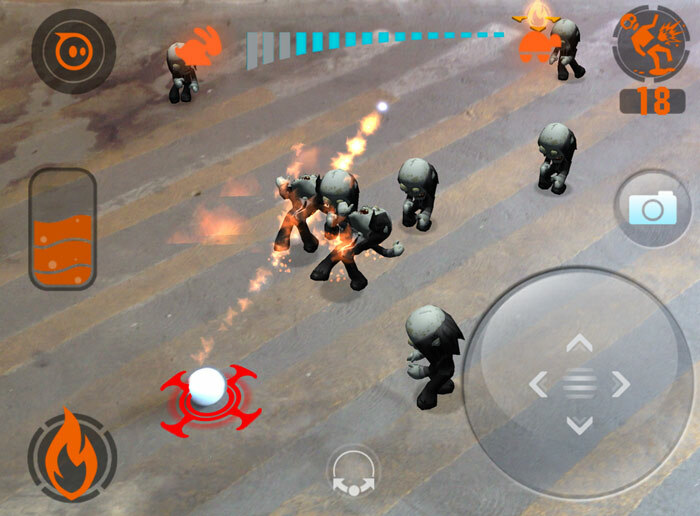 You can try the Rolling Dead, an augmented reality game that you will control your ball to kill zombies, or play virtual golf with Sphero as the ball or you can use it as a controller in Exile. I like the Sphero app only as the other games have outdated graphics and sometimes they even can’t detect my ball correctly. Orbotix seems to focus on the primary app and it runs much more consistently. However, there is an important drawback I figured out when playing with the ball. You will have to re-calibrate the ball each time you turn it on; Also when you change your direction, you will need to do the re-calibration again to drive the ball properly. The ball will lose its compass when you make it jump or dance, so again you will have to re-calibrate it. This is a disadvantage of the sphere design as there is no head like an RC car. That’s great if Sphero can adjust its compass automatically in the next generation. It seems too difficult at the moment because the ball will need the exact position of our phone. Apart from that downside, I’m very impressed with the Bluetooth range of the new Sphero. It is advertised to reach 100 feet and in my test, I could still control the ball normally in the distance of around 80 feet. The battery life is also impressive, it could easily last for over an hour and it takes around 3 hours for a full charge. Notice that you will have to remove the Nubby cover to charge the ball. There are a lot of apps to engage users. Some apps are not responsive and crash very often. Users need to re-calibrate all the time. Despite some issues, I think the Sphero 2.0 is still a great modern gift for any kid or geek out there. I was really surprised with its precise driving experience and beautiful app. You can grab it for around $129 on Amazon.